There’s nothing more important than how your customers feel as they leave your store. It will inform what they tell their friends, if and when they come back, and how often they choose to return. Their most lasting impression comes at checkout. Not only their experience with the cashier, but their experience waiting in line as well. Here are a few tips that will help shape that impression. Research has proven that a unified queue is a much faster method for checking people out. Retailers adopting the single-line queue have reduced walkaways by up to 96%, and report 94% customer approval ratings. Merchandising tables sit between your stanchions. The tables are great for displays or customer surveys. It’s an easy way to ask for feedback without being pushy. Simply leave the surveys and a few pens out on the tables, and people can fill them out as they wait. This way, they’ll be occupied, and you can ask for input without impeding on their free time. 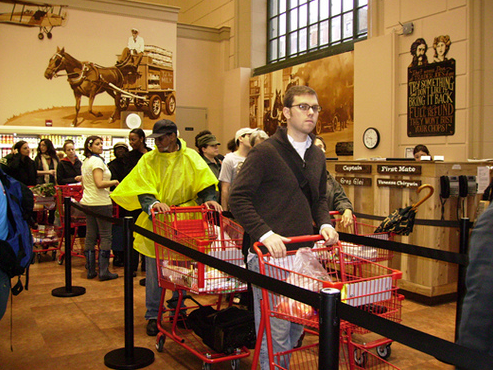 Products merchandised in queueing systems have shown a 400% increase in sales revenue. 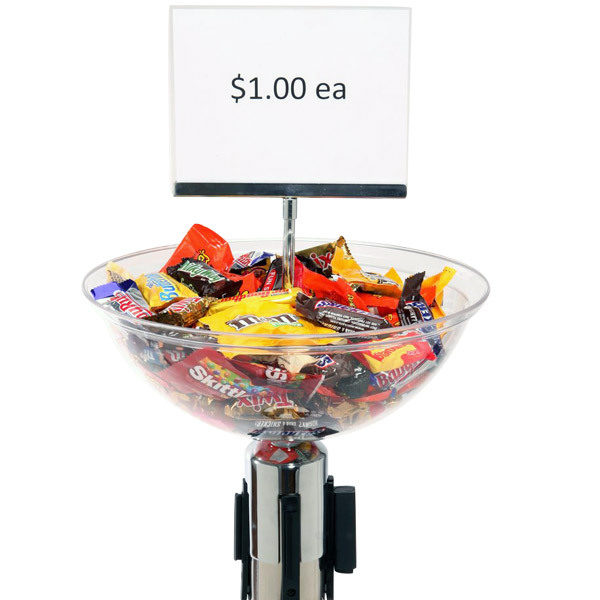 Merchandising bowls, like the tables, simply attach to the top of your stanchions, and display any small – medium sized items. We recently did a case study with a local retailer in Buffalo, testing the effectiveness of these bowls. The results were overwhelming, bringing the retailer an ROI over 100%. Call to learn more. Think of your retractable belts as blank billboards in highly trafficked areas. Why not place a message somewhere on them; advertise a sale or write your mission statement? This will give waiting customers something to read while widening the boundaries of your brand. Click here for more on customized crowd control, or if you’d rather speak with a crowd engineer, feel free to call with questions. Signage can make a huge difference in a checkout line. Signs are frequently used to give the average wait time, advertise a sale, or communicate any other message to waiting shoppers. Consumers like being in control. Telling them how long they’ll be in line is bound to make the wait less tense. Always overestimate to account for any unexpected delays. If you beat the time, they’ll be nothing but happy. These 5 tips should drastically improve the wait experience for your customers. They’re easy to implement, and the return on investment is immense. Call today to learn more – 888.404.7892. Just ask for Ben.